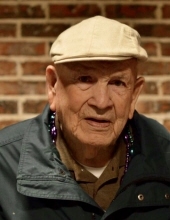 Bobby Harris Saucier, 88, of Oak Grove, formerly of Purvis passed away peacefully at his son’s home the morning of February 8th. He retired from Norfolk Southern Railroad in 1986 and was a veteran of the U.S. Navy. He was preceded in death by his wife Ann Saucier; his son, Stan Saucier, his parents, Talmadge and Stella Saucier and His brothers, Rembert (Gay), J.B., A.L. and Yancy Saucier. He is survived by his son, Mark (Kathi) Saucier of Oak Grove; his daughter, Tina (Gary) Liles of Oak Grove; Sisters, Janelle (Keith) Hagenson of Purvis and Margaret Shoemake of Oak Grove; seven grandchildren, Robbie (Holly) Saucier of Huntsville, TX, Kimberly (Eric) Gilliam of Huntsville, TX, Krissy (Will) Regan of Daphne, AL, Adam (Courtney) Saucier of Oak Grove, Kelly Liles of Myanmar (Peace Corp), Todd (Shannon) Liles of Buda, TX and Melissa (Mackie) Mayfield of Seminary; eight great-grandchildren, Kalli and Katie Saucier, Zoey Holmes all of Huntsville, TX, Cummins Regan of Daphne, AL, Everett and Willa Liles of Buda, TX, Caleb, Abby and Macy Mayfield of Seminary; two sisters-in-law, Wilma Saucier and Donna Saucier and a daughter-in-law, Vickey Saucier. Graveside services will be Monday, February 11, 2019 at 10:00 a.m. at Caney Baptist Church in Lumberton. Memorials can be made to Caney Cemetery Fund. To send flowers or a remembrance gift to the family of Bobby Harris Saucier, please visit our Tribute Store. "Email Address" would like to share the life celebration of Bobby Harris Saucier. Click on the "link" to go to share a favorite memory or leave a condolence message for the family.